If you haven't visited Karma in Mundelein recently, you're missing out. Talented chef Robert Packer dishes out the best contemporary pan Asian cuisine on the North Shore. Karma, fyi, was named one of the best new restaurants in Chicago by North Shore magazine when it opened several years ago and it continues to live up to its reputation. If the great food isn't enough, you'll be pleasantly surprised by the "downtown"décor which is drop-dead gorgeous and the pan-Asian cuisine is simply outstanding. Chef Packer has designed a varied and exciting new menu that journeys throughout Asia. The dining room is stunning and the lounge is one of the hottest spots around (perfect for after work or weekend cocktails for those in the area or willing to travel north). 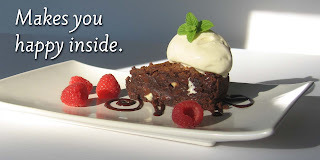 In preparation for next week's media dinner, Cindy photographed the delicious new menu items. Here's a sneak peak of some of the items! Check out these great drinks to go along with the savory dishes: Karma’s refreshing Mai Tai is a delicious blend of Malibu Coconut Rum, Meyers Dark, grenadine, and orange and pineapple juice. 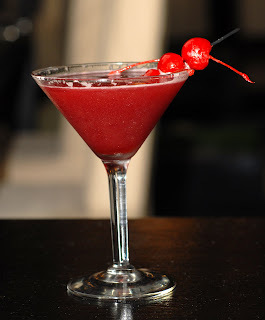 The Geisha Martini is crisp and refreshing with its combination of Absolut Mandarin, Passionfruit, Pom and cranberry juice. Yes please! 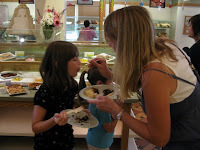 We are now blogging to you live from Deerfields Bakery! 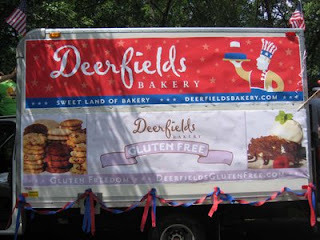 We are here at the media event to introduce Deerfields' gluten-free baked goodies. The event is a huge success. Nearly 100 local people with Celiac disease and other gluten intolerances are flocking to get their first taste of the new products. While we don't have gluten intolerance, we couldn't get enough of the creamy cheesecake with light flaky crust, wildly delicious chocolate cupcakes (moist and light; made with rice flour and our favorite quinoa!) and the balsamic strawberry shortcake with caramel whipped cream - totally yummy. We sampled all 20 gluten-free products, including a first taste of Deerfields' new gluten-free bread, hot out of the oven today. We can't get enough of the Rice Bran Artisan Bread Roll. The local experts told us that it is unheard of to get crusty bread with great texture and moisture! Well, our hat's off to Lisa. By George she's got it! There have been a lot of guests at today's event, including members of the media and the gluten-free community. Media were even able to chat with people living with Celiac disease, and Deerfield baker and the Gluten-free Queen Lisa Albertson led everyone on a guided tour of the bakery's gluten-free production facility. The room was buzzing. We heard cries... delicious. I can't believe it's gluten-free. One woman said that it's been over 15 years since she had cake like this. Several people had tears. The children all had smiles. Thank you Kurt and Lisa! You've outdone yourself. 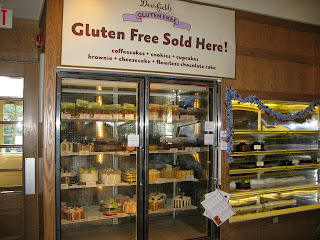 To check out all of the bakery's gluten-free product line and for more information on Deerfields Bakery, please visit http://www.deerfieldsglutenfree.com/. Get an unprecedented chance to learn from Alice Waters, the woman largely credited for pioneering the sustainable and slow food movements in the US, as she takes you around Green City Market tomorrow, Saturday, July 26, to shop for local sustainable foods in preparation for a lunch (at the Palmer House) honoring Michelle Obama. Waters insisted that the food being served to luncheon attendees on Monday, July 28, come from the market. 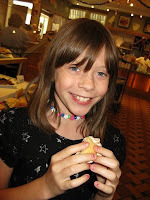 See firsthand how she plans for this event. The free shopping trip is from 8 to 9 a.m.. You can buy her book and have it signed by from 9 to 11 a.m. Proceeds from the book-signing will benefit Green City Market. The shopping trip and book-signing will happen rain or shine. No reservations are necessary. For more information about Alice, visit her website at: Chez Panisse. More about the sold out benefit: cooking with Alice is the Palmer House executive chef Stephen Henry. On the menu, a Chicken Nicoise Salad with loads of market fresh vegetables as well as a baked stuffed Peach with Vanilla ice cream for dessert. If you didn’t get a chance to check out baker Lisa Albertson at the Lincoln Park Whole Foods last Saturday, have no fear! Lisa will be distributing samples of Deerfields Bakery’s gluten-free cookies at the South Loop Whole Foods (1101 S. Canal St.) this Saturday July 26 from 11 a.m. to 2 p.m., and at the Wheaton Whole Foods (145 Rice Lake Square) this Sunday from 11 a.m. to 2 p.m. Be sure to check out these yummy cookies, which are now available at select Whole Foods locations, online at http://www.deerfieldsglutenfree.com/ and at Deerfields Bakery’s three suburban locations. Yum! Don't miss Chicago's best bbq food feast ! It's the annual Green City Market Summer Barbecue taking place Thursday, July 17 from 6-8 pm in Lincoln Park! Sample delicious tastings featuring a bounty of market products prepared by more than 50 of Chicago's top Chef's. One of the best summer events in Chicago, this grand picnic is held in the lovely Lincoln Park, with the fabulous Chicago skyline as a backdrop. This beautiful venue is ideal to showcase some of Chicago’s finest chefs. All of their dishes are prepared using the bounty of the market. Locally made wine, beer and other tasty beverages are all included. Indulge all of your senses with Chicago’s best food, gorgeous views and great music. Please visit the Green City Market Summer BBQ for all sorts of information about the Green City Market events. Sofia Solomon and Judith Schad - Capriole Farms Goat Cheese and Tekla, Inc.
With 17 world-class rib vendors and dozens of other food vendors, the annual Naperville Exchange Club’s Ribfest is always a Mecca for barbecue lovers. 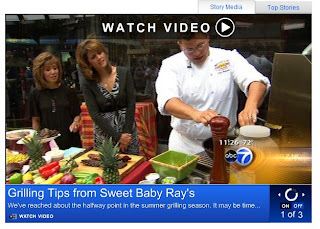 This year’s event, which ran from July 3 through July 6 at Knoch Park in Naperville, Ill., featured Sweet Baby Ray’s restaurant, which won first place in the event’s Best Ribs competition, and earned second place in the Best Sauce competition. Accepting the prize money and trophies included the Sweet Baby Ray's cooking competition team, consisting of "Sweet Baby Ray" himself, Dave Raymond, along with his nephew, Duce Raymond, and cooking competition partner Ron Nunes. Interested in trying the award-winning fare? 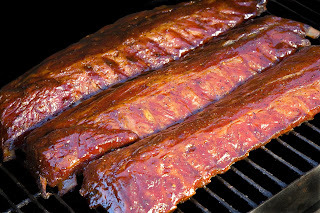 Sweet Baby Ray’s Barbecue Restaurant has two locations: 249 E. Irving Park Rd., Wood Dale, Ill. (630) 238-8261, and 800 E. Higgins Rd., Elk Grove Village, Ill. (847) 437-9555. The Sweet Baby Ray's gang will even be displaying their winning trophies at the Wood Dale location, and in two weeks the hardware will be moved to the Elk Grove Village location. To learn more, visit http://www.sbrbbq.com/. 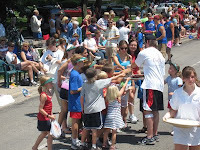 On a beautiful 70-degree day, Deerfields Bakery handed out 10,000 gluten-free Triple Chocolate Brownies and Lemon Buttons to an enthusiastic crowd of parade goers along a 1-mile route in Deerfield. "Gluten-free brownies, gluten-free cookies," we shouted to the crowd. One man ran up to the truck and said to me, "I'm a celiac and I just tasted both the cookie and brownie and they're delicious. Thank you so much for what you are doing!" From non-celiacs we heard comments like, "Wow, this is gluten-free!" and "That's cool." Don't miss the show Newsday reporter Verne Gay calls, "The best unscripted show on commercial television this season." "Hopkins" is ABC's newest documentary mini-series, and airs Thursdays at 10 p.m. EST (9 p.m. CST). The story continues this week, taking viewers inside Baltimore's renowned John Hopkins Hospital to meet both the seriously ill and the doctors who treat them. Molded from 1500 hours of footage, "Hopkins" showcases a raw and honest look at the dilemmas and decisions of some of the world's most talented doctors and the turmoil-ridden families of the patients they treat. You may be asking: "Why is Kurman telling me this?" Our client Elza is the featured female singer/songwriter debuting 12 future hits (we hope) during the series. There's been a lot of media interest in "Everything to Me," from Elza's namesake album "Elza," and "Wide Open." 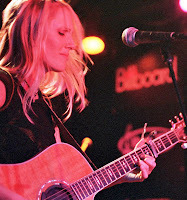 Her new album (not yet released) "Gettin' Free" can be heard on iTunes and at http://www.elzamusic.com/. You can also learn more at Sonicbids.com. Elza's music is not new to the television scene; she has been featured on numerous network series including the WB's Smallville. Her soulful, acoustic sound forms a compassionate musical score and compliments the struggles and heroic efforts of the doctors featured on "Hopkins." This spotlight on Elza'a talent as a singer and a songwriter has catapulted her to new heights. We expect her to keep rising as the star she is! To schedule an interview with Elza, please contact Cindy Kurman at Kurman Communications 312-651-9000. Press here to check out Elza's website or here for the press release.